“I’m mad as hell and I’m not going to take it anymore!” This quote is from a very famous 1976 movie called, Network. I was a teen when this came out and I recall seeing Peter Finch brilliantly deliver that famous line as Howard Beale. Now it’s my turn to use it. It’s April, spring is a comin’ and with that comes the excess of weight loss ads. Even on my Facebook page there’s a push for a green tea bean and how to burn 30 lbs of belly fat per month effortlessly. It’s killing me. Quite honestly, I’m mad as hell and I’m not going to take it anymore! Although awareness about obesity has certainly increased, obesity back in 1976 was 8.7%., and today it is 34.7% . Obesity and its related diseases costs our country 190 billion dollars in healthcare and lost productivity. 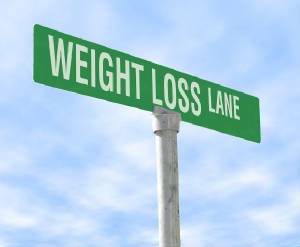 Yet, health clubs and diet programs grow in popularity right along with the American waistline. The thing that leaves me scratching my head is why those that desperately need health clubs don’t go. Given my experience from a personal and professional perspective, I can answer that question, intimidation, unrealistic expectations, fear, feeling out of place, indifference from staff and lack of the truth. Now before my health and fitness friends shout at me, there are a number of very honest, ethical health and fitness professionals and clubs I admire. I just wish there were more. However, with every great, honest health and fitness pro, there are 5 behind him or her waiting to push the latest fad diet, supplements and God knows what else. I was in business for 20 years doing everything I could to educate, motivate and inspire my clients to get healthy the old fashioned way. I hope I made a difference to some. But, thanks to The Biggest Loser and uneducated fitness pro’s that promise 20 pounds in 20 days, my honesty and real life approach was trumped all the time. So who’s fault is it that our country still battles the bulge and opts for medication over recreation? It’s both sides. Consumers have got to know at this point that anything that sounds too good to be true- is. Consumers have to know that it starts with taking a long, hard look at lifestyle and realizing that things have to change, not overnight, but change must occur. Consumers have to know that beating yourself up mentally and physically is NOT the way to achieve good health, it’s quite the opposite. Consumers need to know that there are health and fitness professionals out there actually interested in helping clients go through the process, safely and effectively so that weight loss isn’t temporary but sustainable. Consumers have to understand, work is involved and at times it’s hard. Then it simply becomes a question of whether or not you’re ready. If anyone tells you weight loss is easy, they’re lying. Health and Fitness clubs have got to know that for someone walking in to a health club overweight and out of shape, it is terribly intimidating. Please have someone working the front end that gets it, not someone who is bored with their job and intolerant of incoming guests. Health and fitness clubs need to welcome and respect those that can’t withstand an initial hour-long class that includes squats and lunges as their first class. (I see this all the time). 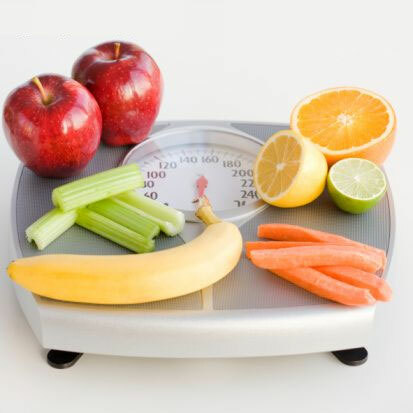 Health and fitness professionals have got to denounce the fast-n-easy weight loss scams out there, stick together and create an alliance for ethical health and fitness practices. Health and fitness professionals can play an amazing role in the health and wellness of our country as long as they understand what the deconditioned client needs to be motivated and ultimately successful. It’s got to be a solid partnership. Health and fitness professionals have an obligation to put clients first and “do no harm.” Check out IDEA’s Code of Ethics. I have to say, I dread this time of year as much as I do December, resolution season. Weight loss adverts ad nauseam. If you’re currently frustrated because you didn’t stick to your goals, don’t be, 98% of people don’t. Instead be more realistic. Don’t buy in to the promises of fast and easy weight loss, thinner thighs in thirty days because aside from all those promises it’s really about you and your health. The only reason you should change your lifestyle if you’re currently inactive or dealing with excess weight is y our health, period. I’ve kept 50 pounds off for over 30 years, not because I’m a rock star but because I remember what it felt like to carry that extra weight and I know what my body feels like now, it’s a marked improvement. At almost 52, I’m medication free. Save yourself money and frustration. If you need help getting on track and staying there, hire a qualified professional that doesn’t make ridiculous promises. Find someone who puts your health first. 1. If diets worked, obesity would be non-existent. 2. The only way to get yourself healthy for the long-term is find a way to move everyday, even if it starts with a walk around the block, and focus on eating less food with more nutritional value. 3. It’s weight loss season and the hype is here, don’t get sucked in. Here’s to a healthy spring and a healthy you. Here’s to never wishing for more time, rather making the most of it! 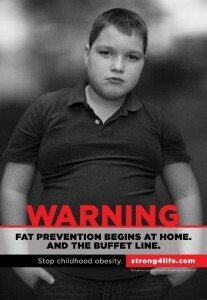 Kids and Obesity- Who Is To Blame? If they were looking for volunteers, I’d be the first one in line to help teach kids about healthy living. There is clearly a shortage of health education for kids these days, and if it is being taught, it’s not being taught well. Full disclosure, years ago, I fed my kids fun fruits and fruit roll-ups. Yes, we went to McDonald’s and Burger King. I potty trained my kids with M&M’s, yes, I did all the things I shouldn’t have done. But that was before I knew something wasn’t right. When I was pregnant, I made every effort to eat whole, pure food. Why should I feed them differently now? So, I made the decision to educate myself on food and the ramifications of feeding kids garbage, I reigned in, much to their disappointment. 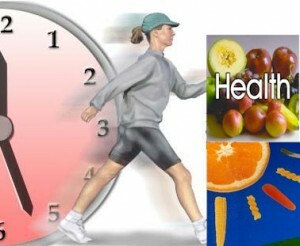 I have been working with obese/inactive adults for almost 20 years. In the last 5 years, I have had a surge in Mother’s coming to be me with their young daughters, 11, 12, 13. “They just won’t stop eating. Their siblings are thin, their friends are thin, so I just want her to feel comfortable in her body and lose some weight.” All of this said in front of their child. I often ask parents what types of foods they buy at home, “Well, the other kids know when to stop, they don’t over eat some of the junk food I buy. Plus they’re really active. She just can’t eat that stuff.” My reply, “Well, why do you buy it?” Mother’s response, “Why should I have to punish the other kids when they don’t have a problem?” Hmmm, punishment = taking away junk food. And this my friends is where the problem starts. 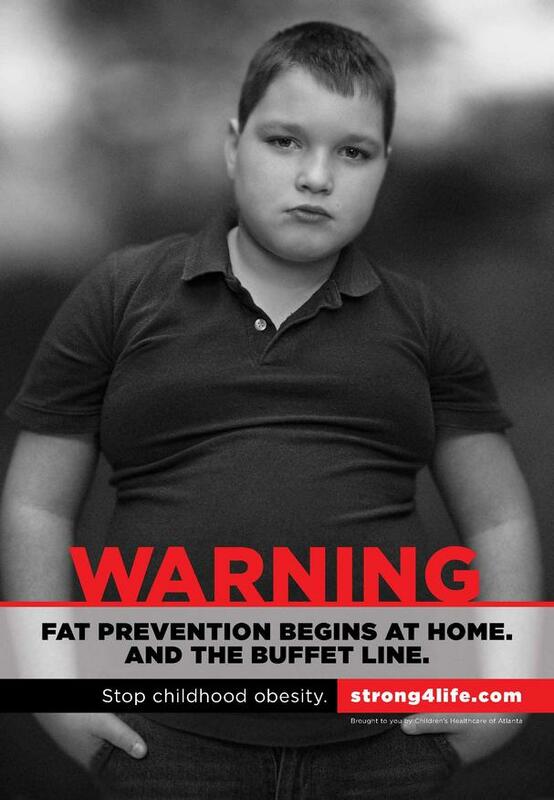 Recently, there’s been some controversy over a new ad campaign in Georgia (which has the 2nd highest obesity rate for children) utilizing obese kids to get a message across; fat is bad. Some people are mortified by them, while others think they will have a positive impact. Me, I’m not so sure. 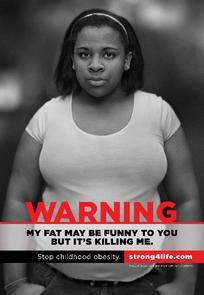 As an obese teen, I find the ads offensive and ineffective. First of all, the photos should be of the whole family, not just the child. Second, I think a child that is 8 or 9 years old is being exploited and stigmatized. 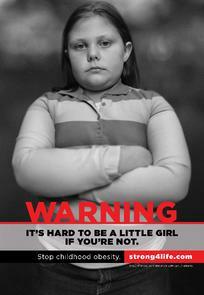 You don’t think kids will be bullied or teased when they see these ads? One of the ads, “Big bones didn’t make me this way, big meals did,” will surely result in teasing on the playground. A more positive approach would be a picture of an entire family that says: “A healthy child is the result of a healthy home.” or “A fit child, comes from a fit family.” Bottom line, FAMILIES need to be educated on food and how they feed their children. Just because children are active in sports does not justify a run to a fast food restaurant following practice. Parents will tell me, “Well, we don’t have time to cook a big meal, drive-thrus are just easier.” Well, they may be easier, but that’s not setting your child up for success when the shopping is ultimately u p to them. Further, most parents are bound and determined to see that their kids do well in school and in life, shouldn’t nutrition and exercise be part of their rearing? 40 years ago, it was different, but today, it should be mandatory for every family that has a kindergarten age child, go to a class that teaches families the value in raising kids with healthy food and lifestyle. Even in low income areas, you could get volunteers teaching famlies how to eat healthy on a budget. (A girl can dream, can’t she?) A peanut butter and jelly sandwich is far better than a fast-food burger, or jumbo sandwich. We, the parents are responsible for our children, and it is up to us to see that our children learn the importance of eating well and staying healthy. What they learn about nutrition now, they will carry through to their adult years. They won’t always be playing soccer or running track, so introducing healthy eating and reasonable ways to stay active, should not be done just for inactive kids, it should be for ALL kids. I’m not crazy about the ad campaign, I feel that there could be a much more tactful, effective way to get the message out about childhood obesity. The people who came up with the campaign believe that the “shock and awe” value is what’s needed to wake people up to the problem of childhood obesity. I’m not so sure I agree. I think the only thing that is going to help, is educating families on what constitutes healthy eating and it needs to start from birth. We can’t blame schools, vending machines, ads, fast-food restaurants for the obesity epidemic, rather it’s up to us to do the research, understand how junk food and fast-food compromises our health and begin making positive changes for ourselves. That way, we will be better equipped to pass it on to the next generation without feeling the need to objectify kids to make a point. Where Did We Lose the Fun with Exercise? I recently started training a 14 year old girl. She’s never been interested in organized sports and the idea of exercise is, well, a turnoff for her. She doesn’t understand how people can ‘LOVE’ exercise and finds it odd that people actually do it every day. For me, I totally get it. I too was a teen that resisted exercise because it looked like too much work for something I wasn’t good at. 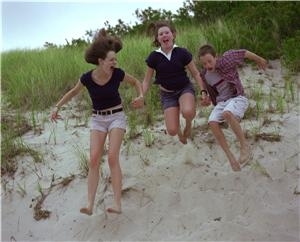 Friends of mine that were athletic, were naturally athletic. I had to work too hard to look like I sort of knew what I was doing, and failed miserably. It had a negative affect on my self esteem and only reminded me how uncoordinated I was. Athletics was was not my thing, so I stayed away from any kind of exercise because I thought being uncoordinated meant you couldn’t exercise. After all, exercise was for fit people, not me. Unfortunately, kids that aren’t ‘natural’ athletes believe that they can’t be active, but that thought couldn’t be further from the truth. We need to make exercise fun for both kids and adults alike. I have plenty of adult clients that loathe exercise and it’s my job to create an environment of fun. If they’re having fun, they’re going to keep coming back to it and feel good about their experience. If we put exercise in to such a structured box that it becomes exclusive, we will lose a lot of people to inactive lifestyles. There is no better time than now to teach kids and adults that exercise (formal word for fun movement) can be fun. Create a playground in your basement, or in your backyard that includes a variety of games and activities. There is an abundance now of video games that encouragse activity including Dance, Dance, Revolution, Wii Fit and Dance Mania. If I would have known that exercise didn’t have to be about going to a gym and humiliating myself through some poorly suited exercise class, or joining an organized sport, I think I would have been a lot more active. But kids and adults now have the opportunity to find FUN in exercise. As a fitness professional, that’s always my goal to help them do just that! Here’s to finding fun in your fitness routine!